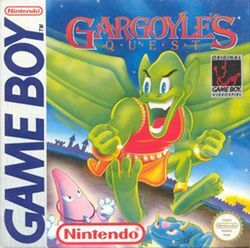 Gargoyle's Quest (labeled as Gargoyle's Quest: Ghosts'n Goblins on the title screen), known as レッドアリーマー 魔界村外伝 (Reddo Arīmā Makaimura Gaiden, "Red Arremer: Demon World Village Side-Story"?) in Japan, is an action platformer with mild RPG elements. It was developed and published by Capcom on May 2, 1990 in Japan and in July it was released in the United States and Canada. The main character, Red Arremer (Firebrand in the US) made his debut in the Ghosts'n Goblins series. Gargoyle's Quest was followed by two sequels: a NES game called Gargoyle's Quest II released in 1992 and Demon's Crest for the SNES in 1994. Red Arremer (Firebrand) is a gargoyle who is predestined to be the Red Blaze who saves the Ghoul Realm from the evil wrath of King Breager and brings peace to the land once again. A long time ago, the Ghoul Realm barely escaped great peril. A large army of Destroyers came from a neighboring universe. The creatures of the Ghoul Realm were no match for the powerful Destroyers. Just when everyone had given up hope, a great fire swept over the Realm, wiping out the Destroyers' army. This page was last edited on 16 July 2016, at 19:13.